It is already May, but in Haiyuan, Ningxia province, the weather is still cold. Travelers to Haiyuan at this time of the year may be suffering from the dry and chilly weather after staying for only two or three days. So, it's not hard to understand why "spring rain is more precious than oil" in Haiyuan. The 26-year-old Yang Jinlong is operating a forklift skillfully, shoveling piles of the medicago into the electric feeder driven by his colleague. When he is on shift, he would also drive the electric feeder to the cow farm to distribute forage to each cow. As he watches them using their flexible tongues to take the forage in, Yang Jinlong feels extremely happy. He visits these 20 cow sheds every day. After dropping out of school at 14, Yang Jinlong had worked as a miner in coal mines and a construction worker at various construction sites together with his parents. Life was never easy for him. Having a decent job with a stable income in his hometown was something that he had never imagined. However, the dream came true when he found a job in CR Beef Cattle Base close to home. He became a formal employee of the Base in just 6 months for his good performance in the probation period. Yang Jinlong likes the job very much, as it allows him, a father of two, to take care of his wife and children, parents and grandparents. One day, he learned the "cow foundation bank" poverty-alleviation program. CR Group sell Simental cow to poverty-stricken households on credit. Each household will get 3-5 cow with a zero-interest loan of RMB 6,000 and a government subsidy of RMB 2,000 for each cow. After 3 years, the ox will be purchased back at a price of RMB 28/kg, the bottom price, or higher to pay for the loan. The cow, however, will continue to be fed and raised by the farmers to produce more cattle. Now, local villagers call the cow they bought on credit "CR cow". With his parents growing old and little brothers and sisters to look after, Yang Jinlong could no longer work as a migrant worker. So, he persuaded his family to join the "CR cow foundation bank" program. In early 2016, being convinced by him, his parents raised RMB 15,000 and purchased 4 cow on credit with a bank loan of RMB 24,000. In December 2016, two cow produced calf and soon in February 2017, the other two also produced calf: an ox and a cow. In early 2018, three cow gave birth to their second calf. Mentioning the calf, Yang's father couldn't hide his excitement. "When the first calf was born, the whole family was so excited. Because it means our work paid off. Raising cow at home is much better than working outside as migrant workers. In 2017, two calves have been purchased by CR, bringing an income of RMB 20,000, adding the salary of Yang Jinlong, the annual household income of the family has reached RMB 60,000. They build a new house with bricks, consolidated the floor of the yard with cement and changed for a larger door. Life finally began to change for the better. Having greater confidence in "CR cow foundation bank", Yang Jinlong and his father decided to expand the size of their cow shed and purchase more cow. Xihaigu, Ningxia, a place that sounds to be vast, passionate and strong, is labeled as the "poorest place in China". Haiyuan is one of the eight national poverty-stricken towns in Xihaigu. Years of draught and water shortage made the place desolate and poor. All you could see is sand even in spring. A 8.5-scale earthquake nearly a century ago made the situation worse. People suffer from poverty and pain. At the end of 2012, at the call of the State Council, CR began to aid poverty alleviation in Haiyuan. With "targeted poverty alleviation" becoming the priority of the central government, CR launched the "cow foundation bank" model for poverty alleviation as part of the grass and cattle integration program with the support of local governments. The program provides interest-free loans to poverty-stricken households to help them develop cattle-raising business from scratch. 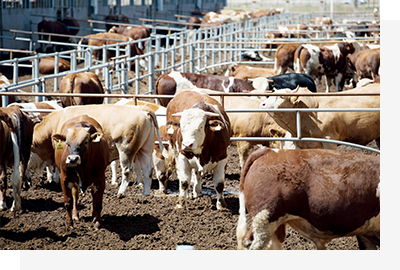 CR Ng Fung and CR Vanguard are responsible for selling beef and beef products nationwide, even to Hong Kong. "We want to get the local people engaged and then establish our own brand to sell the products. Local farmers are responsible for raising cattle for us. In this way, our program can really help local families to shake off poverty through their own work". 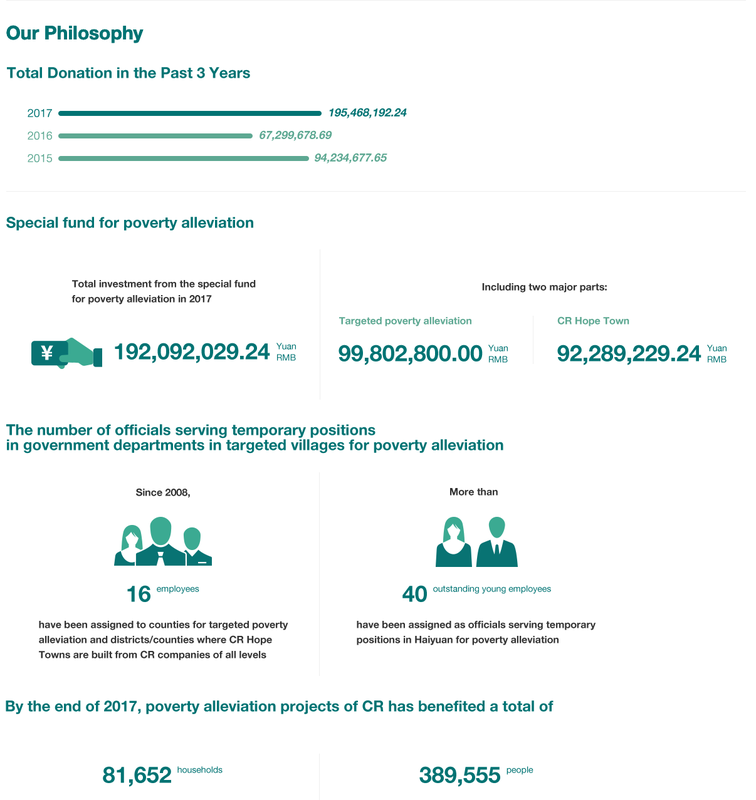 CR is full of confidence for this unique sustainable poverty alleviation model. With the idea of "leaving no one behind", CR launched "village-level collective cattle raising" and "collective cattle raising for households unable to raise cattle by themselves" to develop village level collective economy through distributing dividends every year and help households without strong labor due to sickness or disability to get rid of poverty. By the end of 2017, CR has sold 13,400 cow on credit, had 450 cow in collective care, benefiting more than 5000 poverty-stricken households in 16 villages across the town. A total of 1,268 calves have been produced and 30 cattle have been purchased back from 26 households at a total sum of RMB 297,800, creating an average household income of RMB 11,500, dragging some households out of poverty. Besides, CR has also cooperated with 77 villages having been removed from the list of poverty-stricken villages to raise 2,889 Aberdeen- Angus cattle, which helped to increase the average income of each village by RMB 27,670 from dividends for 6 months. Now, with the calves growing up healthily, farmers living in poverty are seeing a light of hope. 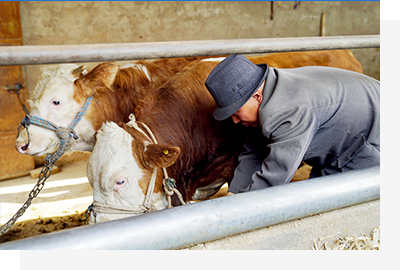 With the active participation of the public, cattle raising has become a pillar industry for the local economy, turning Haiyuan into a leader in animal husbandry in the local area. Mu Hua, Director of the Poverty Alleviation Office of Haiyuan, witnessed the development of the project and the changes it has brought. "The project launched by CR bring us with a new approach towards poverty alleviation. It is the threshold for Haiyuan to shake off poverty that ignites the light of hope in the heart of the people living in poverty. I sincerely hope that the project could be carried out steadily and sustainably". Under the principle of "taking concrete actions to combat poverty", CR people left their footprint in Haiyuan. Now, the first "Five-Year Plan" has been carried out, a new "Three-Year Plan" is being launched. CR will continue to make greater efforts in R&D, disease prevention, forage preparation, slaughter and processing to expand the industrial chain, create more local jobs and attract more talents, so as to realize sustainable and sound development of the animal husbandry industry in Haiyuan. The footprints of CR people have covered every part of China. For example, Dong E E-Jiao (DEEJ) adopted an innovative donkey raising model in Shandong and Inner Mongolia. The company provides "babysitter-style donkey raising services" to launch tailored plans according to local circumstance and share the replicable and sustainable solution with the rest of the country to facilitate poverty alleviation nationwide. Take poverty alleviation efforts in Haiyuan as an example, CR hopes to help more poverty-stricken areas like Haiyuan and Xihaigu to get rid of poverty and step on to the road of hope and prosperity and make its own contributions to the implementation of the strategy of the rejuvenation of rural areas, so that every farmer could live a decent life and every village could benefit from the rapid development of the national economy in the new era. Migrant workers helped the Chinese economy to maintain high-speed growth for 30 years, which is considered as a miracle across the world. They build up the cities, but could barely find a roof on their head in the dirty and backward urban villages; they created the prosperity of the cities, but left their own villages declining; they take care of children in cities, but could only meet their children once a year during the Spring Festival. Yang Jinlong is an epitome of hundreds of millions of Chinese farmers. Four years of poverty alleviation in Haiyuan allowed us to see the helplessness of farmers in the face of poverty and their courage and persistence in fighting against poverty. We are proud to see that with the help of CR, they are able to shake off poverty and change their lives. For a long time, with the mission of "better life together", CR has been actively carrying out its responsibility for the public, caring about hotspot issues in social development and using its own resources to organize poverty alleviation and volunteer activities. Through the development of CR Hope Towns and targeted poverty alleviation projects, CR has been exploring for new solutions to realizing the rejuvenation of rural areas and winning the battle against poverty, improving people's wellbeing and realizing the harmonious development between businesses and the society. With business operations at home and abroad, China Resources, a stateowned enterprise, central enterprise and Hong Kong-based enterprise, has extensive social connections and influence. CR has always been regarding promoting the harmonious development of the society as a major goal of social responsibility fulfillment. Bearing the goal in mind, CR is engaged in promoting regional business prosperity, improving communities and the wellbeing of the people and creating a good environment where everyone enjoys life and work. CR constantly strengthens its connection with all sides and devotes itself to building a bridge between the government, the society, the vulnerable, volunteers, local residents and communities. In developing its own business, CR has never failed to meet the expectation of the government and the public on social responsibility fulfillment. In the future, we will continue to upgrade our products and services, adopt innovative ways to communicate with the government, the public and the communities and actively participate in discussions of major social issues such as consumption upgrade and community construction to make the public feel safer and more satisfied.